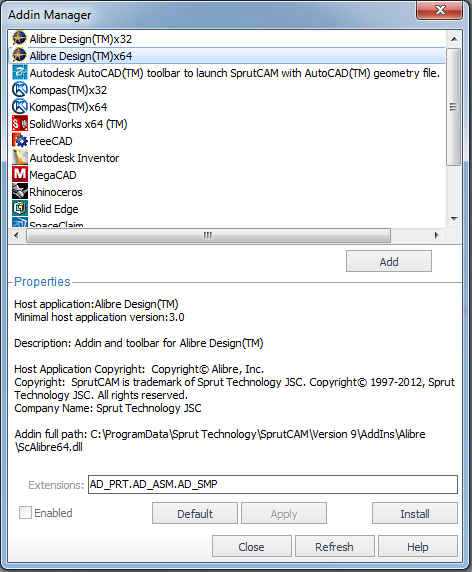 SprutCAM ® Addin Manager is program designed to control SprutCAM ® addins and external CAD translators. To run the program use Start –> Programs –> Sprut Technology –> SprtCAM 9 –> SprutCAM Addin Manager. Select necessary addin from the top list. Press <Apply> button to save changes (custom). Addins are lists in top list. When one of them is selected then additional information is displayed on the <Parameters> panel. Usually it are name and version of application addin works with; description of addin abilities etc. Editable parameters (if exists) are on this panel too. If addin was installed already then it could be switched on/off without lost changes of it's default parameters by the <Enabled> checkbox (sequence of buttons <Uninstall> <Install> will reset all changes and as result addin will be installed with parameters by default). Field <Extensions> illuminates if only a selected addin supports misc manipulation with files with specific extensions (types), for example file import. In this sample user could edit file types which will be imported by addin selected. <Default> fills properties by default for the selected addin. For example if file extensions were changed then press of <Default> resets its as default values from addin. <Apply> saves changes for addin selected. <Install> / <Uninstall> – registers/unregisters selected addin for a work. <Close> – closes SprutCAM ® Addin Manager. If there were changes then will be illuminated dialog <Save/No/Cancel>. <Refresh> – rereads all addins. Note: all changes will be lost. <Help> – displays this help. Note: In some cases there is need to reload application (addin host) when addin properties are changed. For example after installation of the 'SprutCAM ® toolbar for SolidWorks ® ' addin SolidWorks ® should be reloaded. Note: All addins must be in the 'Addins' folder (the folder for SprutCAM ® Addin Manager) and/or its subfolders. SprutCAM ® Addin Manager scans those folders to look for addins and lists its. That is enough to place any addin (from Sprut Technology Inc. or from any other source) to those folders and it will be accessible for SprutCAM ® Addin Manager (press <Refresh> button if SprutCAM ® Addin Manager is run). 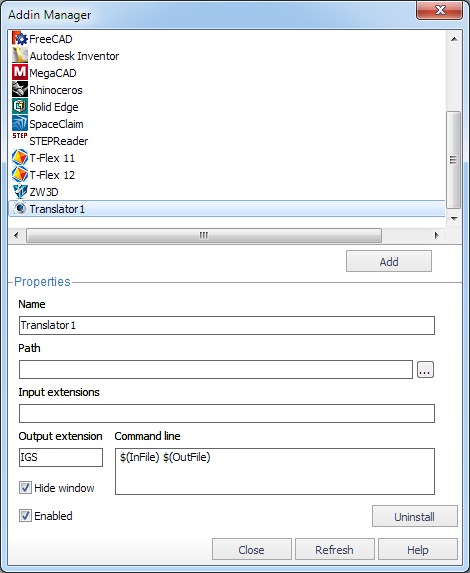 You can use the Addin Manager to plug external CAD translators into SprutCAM. A CAD translator is a program which is able to convert one file format into another (e.g. CATIA into IGS) and supports the command line interface (e.g. you can type convert.exe Model.CATIA Model.IGS in a command line and the translator will generate an IGS file from the CATIA file). After registering a cad translator in the Addin Manager you will be able to seamlessly import the cad files supported by the translator into SprutCAM. Note, the output format of the translator must be one of the native SprutCAM formats (e.g. IGS, STL, 3DM). Click on the <Add> button. Fill the parameters of the translator. <Path>. This is the full path to the translator executable. You can fill this field by pressing the ellipses button next to the text box and navigating to the executable using the standard windows file explorer. <Input extensions> Here you should enter the input file extensions supported by the translator. The extensions must be dot separated. E.g. model.ipt.step.sat. <Output extension> In this field you have to specify the output file extension of the translator. It must be one of the formats SprutCAM supports natively, e.g. IGS, 3dm, STL.